With heightened awareness of safety and environmental issues, reducing leaks from flanged assemblies has become a major priority for industry. It is therefore important for companies who use gaskets to choose the correct material for the job and install and maintain it correctly to ensure optimum performance. A flanged joint will remain tight as long as the surface pressure in service is higher than the minimum surface pressure required to achieve the necessary levels of tightness but is lower than the maximum permissible surface pressure.But increasingly high demands on the tightness requirements for flanged joints (e.g. Tightness class L 0.1 in accordance with DIN 28090) necessitate the application of high loads on the gasket material in order to meet these stringent requirements. increasing temperatures (e.g. 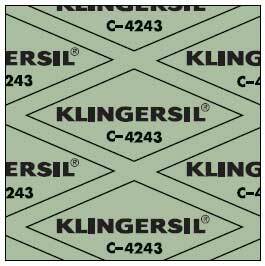 KLINGERgraphite laminate, KLINGERtop-chem or KLINGERtop-sil). 1000 x 1500 mm, 2000 x 1500 mm. other thicknesses and sizes on request. factors beyond the manufactor’s control. We can, however, vouch for the excellent quality of our products.